Problem: The furnace in a condo in Easton PA failed due to extensive water damage. It would cost too much to repair. Solution: Installed a new Heil Main Series Two-stage variable-speed furnace with energy-efficient air conditioning condenser. Just about any cloud can have a silver lining. For a condo owner in Easton, their cloud started with a literal one: a rain cloud. Fortunately, UGI Heating, Cooling & Plumbing was able to make the most of a bad situation. Our condo owner called UGI because her heating system stopped working. After doing a furnace inspection, we found the problem: a leak in the condo’s roof. Over time, rainwater seeped in. It damaged the furnace’s surface ignitor and rusted out the system. It was bad enough that we suggested getting a quote for a new HVAC system entirely. It would take too much work to repair this one. Of course, that’s not what our condo owner wanted to hear. A new system is a big investment. (How much does a new furnace cost?) Fortunately, we helped her pick out just the right system for her. Now, she’s happier with her new furnace and central air conditioning than she ever was with her old one. 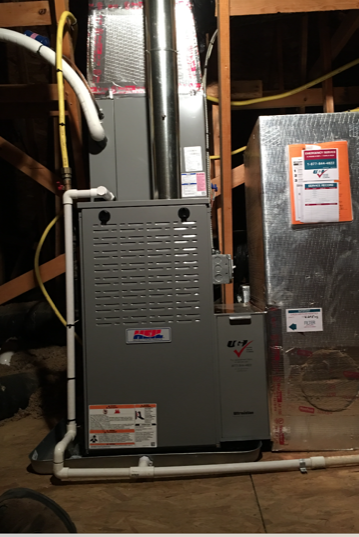 One of the best ways to make this furnace replacement a good experience would be to upgrade the heating and cooling system entirely. There would be a significant up-front investment. But, our condo owner would pay less each month in utility bills. The way to save money each month is to use less energy to run the system. That brought us to a Heil two-stage variable speed natural gas furnace. It doesn’t use nearly as much gas as her old one for a few reasons. First, it’s an Energy Star-certified unit. This designation means it meets government standards showing that it uses less gas than similar furnaces. The way to measure this is with the Annual Fuel Utilization Efficiency, or AFUE rating. This measures how much gas actually goes toward warming the home versus how much gets lost through exhaust. Older furnaces have AFUE ratings as low as 80 or 70 percent. Anywhere from 20 to 30 percent of the natural gas a person pays for is wasted. This new one, however, has an AFUE of up to 92.6. When it’s working its best, it loses less than 8 percent of the gas it uses. There are similar savings in the summer. For air conditioning, the unit has a Seasonal Energy Effectiveness Ratio of 16. Without going into specifics, the higher the number, the less energy the unit uses to cool a room. By contrast, the average window unit air conditioner has a 10 SEER rating. Meanwhile, to qualify as Energy Star, you need a 16 rating. This unit fits the bill. Along with saving money, our condo owner’s new system was also easier to use. And, it provided heat that just felt a little better. While picking out a new unit, our installer also suggested getting a Media Air Cleaner with a MERV 11 filter. This filter offers quite a few benefits. A system like this does more than just prevent dust from blowing through the ducts and vents. The air cleaner and MERV filter also work together blocking smaller particles. These include allergens like pollen, which can plague people who are allergic to them. This effort adds up to cleaner air for this condo. And, it will help cut down on runny noses and watery eyes during allergy season. Plus, unlike regular filters that need changing every three months, these filters last for half a year or more. The new furnace also is also variable speed. This feature is different from the old furnace, where it was either on or off. That can result in the area becoming too hot if the unit suddenly has to push out a lot of air to warm up the condo. Or, the temperature may drop too far when it’s off. Now, the furnace can run at different strength levels. It’s not “all or nothing.” If the condo only needs a little boost, the heater can kick on at a low level. Over time, this prevents the unit from working too hard and breaking down. And, it provides “even” heating, so the condo doesn’t get too hot or too cold. Our condo owner had plenty of questions from the beginning. That’s very understandable. After all, most people aren’t exactly HVAC experts. They don’t think much about their heating and cooling system until there’s a problem. And, that’s fine. After all, it’s what we’re here for. We made a point to work at our client’s pace. We didn’t rush through anything or direct her to brochures or websites. Instead, we made sure to answer each question directly and thoroughly. That goes a long way for a big investment. It’s important for a client to feel confident about what’s happening and understand what they’re purchasing. It helps them make the right choice and make the most of their new investment. Once we were done, our condo owner told us how much she appreciated our patience and professionalism throughout the process. Even though she came to us in a bad situation, we were able to turn things around for her. Now, she says, she’s recommending us to anyone who needs a furnace inspection, replacement or repair. 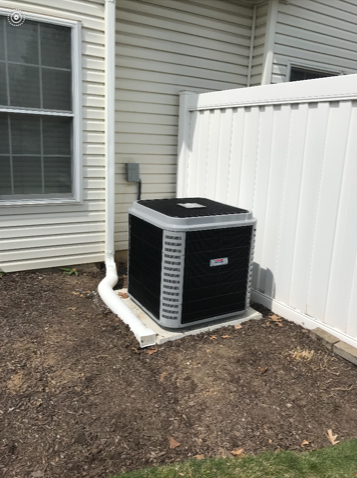 Are you looking to replace or upgrade your HVAC system? Contact us, and we’ll design the perfect solution for you!